Functions as a cell surface receptor and performs physiological functions on the surface of neurons relevant to neurite growth, neuronal adhesion and axonogenesis. Involved in cell mobility and transcription regulation through protein-protein interactions. Can promote transcription activation through binding to APBB1-KAT5 and inhibits Notch signaling through interaction with Numb. Couples to apoptosis-inducing pathways such as those mediated by G(O) and JIP. Inhibits G(o) alpha ATPase activity By similarity. Acts as a kinesin I membrane receptor, mediating the axonal transport of beta-secretase and presenilin 1. Involved in copper homeostasis/oxidative stress through copper ion reduction. In vitro, copper-metallated APP induces neuronal death directly or is potentiated through Cu2+-mediated low-density lipoprotein oxidation. Can regulate neurite outgrowth through binding to components of the extracellular matrix such as heparin and collagen I and IV. The splice isoforms that contain the BPTI domain possess protease inhibitor activity. Induces a AGER-dependent pathway that involves activation of p38 MAPK, resulting in internalization of amyloid-beta peptide and leading to mitochondrial dysfunction in cultured cortical neurons. Provides Cu2+ ions for GPC1 which are required for release of nitric oxide (NO) and subsequent degradation of the heparan sulfate chains on GPC1. 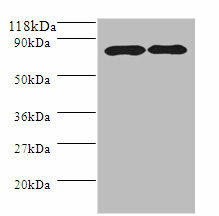 Amyloid Beta A4 Protein A Polyclonal Antibody. Unconjugated. Raised in: Rabbit.